It is easy to find ideas and practices that divide us, superficial markers like ‘caste’ or ‘religion’ that allow us to brand somebody as ‘The Other’. 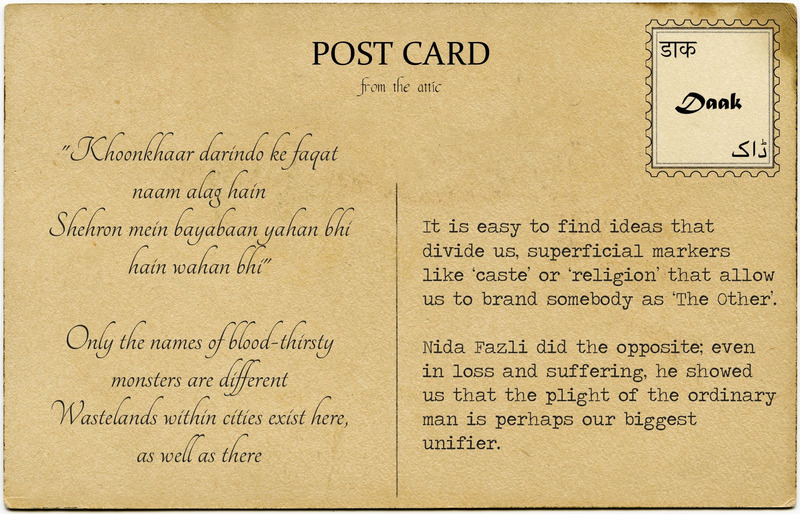 Nida Fazli did the opposite; even in loss and suffering, he showed us that the plight of the ordinary man is perhaps our biggest unifier. The fight then, is not against this imaginary ‘Other’ but against the people who exaggerate our differences. Nida Fazli (1938-2016) was an eminent Urdu poet and lyricist. During the partition his parents migrated to Pakistan, but a young Fazli decided to stay back in India. He moved to Mumbai at an early age and ended up composing many memorable songs for the film industry. Fazli revolted against the elite and stylistic forms of Urdu and Hindi, favouring instead, a simpler colloquial language that would speak to everybody. He embraced and wrote all forms of poetry including ghazals, nazms, dohas and songs. He composed many lines on the brutality of the politics which manufactured religious fanaticism and eventually led to the partition. He emphasized the need to focus instead, on the struggles, both social and philosophical, of people who were trying to come to terms with loss and displacement. *Mir Taqi Mir (18th century poet) is widely revered as the foremost Urdu poet. He wrote the following lines which are echoed by Fazli: “Dekh toh dil ki jaan se uthta hai, ye dhuan sa kahan se uthta hai” (See whether this smoke arises from the heart or the soul).